The Cluster Scorecard view provides a summary of the vital statistics of the cluster as well as an initial visualization of the pattern that was formed by the order and fill messages that comprised the cluster. You can laos view the activity in the cluster in the context of the market data at the time. Clicking the Inspect button in the Actions column of the Cluster List View opens the scorecard for the selected cluster. Cluster Statistics and Scorecard Metrics: Displays statistics and metrics for the trading activity analyzed within the cluster. Filled Positions and Working Orders: Displays the trading activity and volume of contracts traded within the cluster over a period of time. 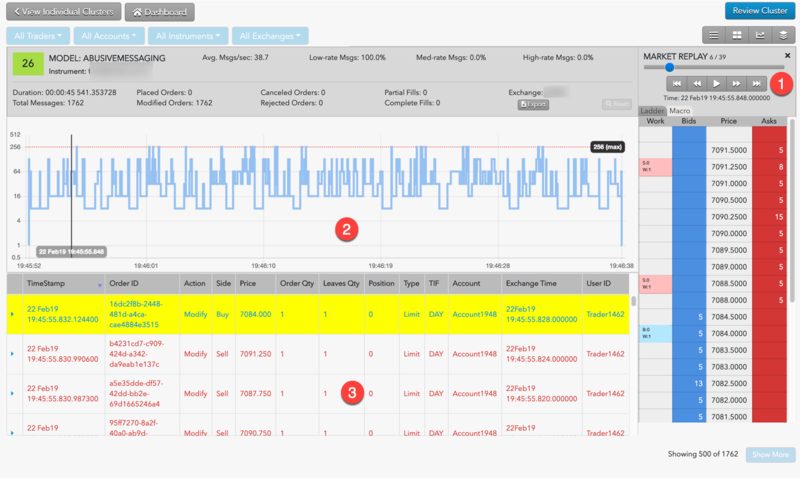 Trading details hover pane: Shows the trading details at a point in time by hovering over the graph. Market replay: Provides different time-based views of the trading activity overlaid with market data in a ladder view or a macro view. Audit Messages: Shows the actual order actions from the audit trail with some minor normalization of things like Order Type, Side and Order Action. Rows are color coded by action and side. Order Activity: Shows the actual order actions from the audit trail with some minor normalization of things like Order Type, Side and Order Action. Rows are color coded by action and side. Cluster Scorecard controls: Allows you to export data, replay data, review a cluster, and inspect the machine learning vectors. The Cluster Statistics and Scorecard Metrics sections provide general information about the cluster as well as model-specific details. This section at the bottom of the Scorecard provides a look at the volume of contracts traded within the cluster, as well as how the order and trade activities unfolded over the relevant period of time. You can hover the mouse over a spot the chart to view the trading details in the Audit Activity section. A chart can be drawn below the audit trail for Spoofing and Abusive Messaging clusters. The Spoofing chart shows the buys and sells (working and filled) along with Iceberg (disclosed) volume and markers when the trader is flipping the market. The Abusive Messaging chart shows when the message rate is excessive. This section shows the actual order actions from the audit trail with some minor normalization of things like Order Type, Side and Order Action. Rows are color coded by action and side. Audit fields are described in the following table. Timestamp Date and time the order was submitted. Order ID Unique TT order ID for internal tracking. Action Type of order or fill action on the execution report. Side The side of trade (Buy or Sell). Position The user's position. Positive numbers indicate a long position. Negative numbers indicate a short position. Type The order type. Supported order types vary by exchange. TIF The order Time-In-Force restriction. Supported TIFs vary by exchange. Exch Time For messages going to the exchange, this represents when the message is sent to the exchange from the order server. For messages received from the exchange, this represents when the message is sent from the order server to the rest of the TT platform. User ID The TT platform user identifier. You can view the life cycle of a selected order in your cluster by clicking an order event row in the Audit Messages section. The order history appears under displays beneath the selected order. Time Date and time the order was submitted. Exch Exchange defined execution identifier. Exec Type Type of order or fill action on the execution report. Order Type The order type. Supported order types vary by exchange. Order Status The order status at the exchange. B/S The side of trade (Buy or Sell). Last Price The last traded price. Acct Account used to submit the order. Ladder view: Replays the market activity in a ladder-like internface as it occurred during the time period covered by the cluster. Macro view: Displays the trader's activity in the context of of market conditions at multiple price levels during the time period covered by the cluster. The Ladder view is a research tool that provides users with a frame-by-frame replay of the trading activity overlaid with Level 2 market data on a ladder-style interface. The ladder is 10 ticks deep and displays all market data, including the orders for each relevant participant in the order book. 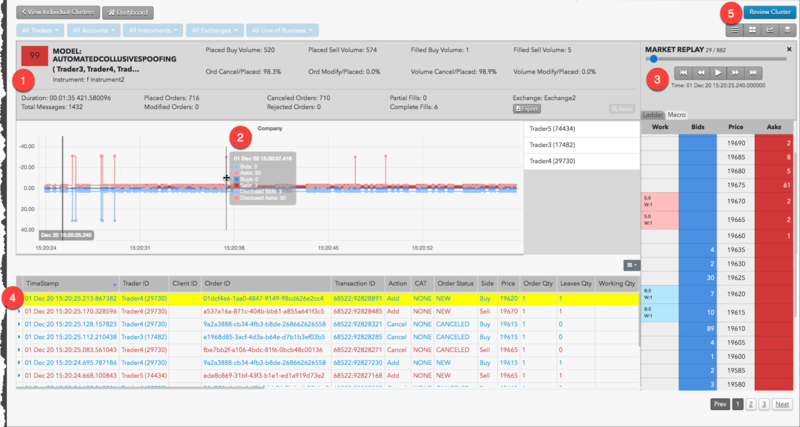 Users can stop, start and rewind the playback of the activity within a given cluster in order to gain a precise understanding of the sequence of events that occurred in the order book and how the trader’s orders impacted the market. Interactive display of the market ladder for the specified time frame. Graph of trading activity showing buy and sell orders along with a bar indicating the current time in the replay. List of Audit Trail messages that comprise the activity included in the Market Replay. 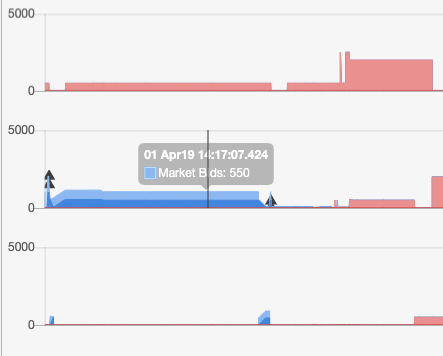 Click Play to watch the market react as the order activity in the audit messages are replayed. 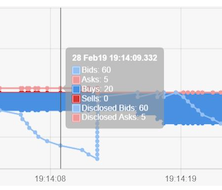 As the market replays, a vertical bar tracks the progress in the graph and the audit messages are added as they occur. 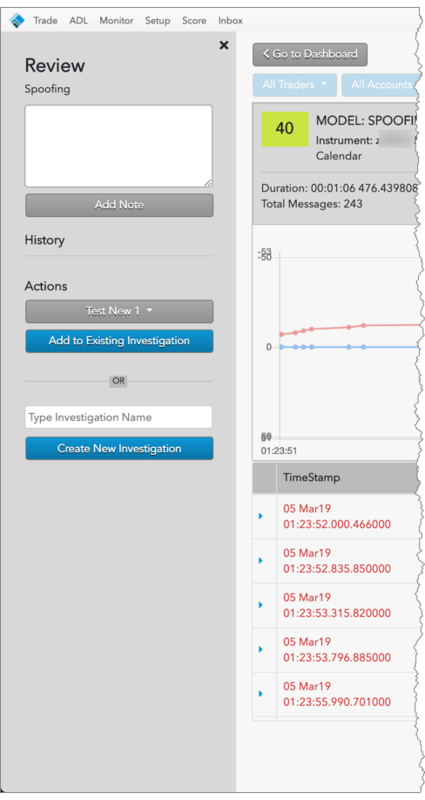 The Audit Message section lists the history of every audit message generated from the start of the replay to the current point in time of the market replay. The You can start, stop and rewind the activity to help get a clearer picture of potentially problematic trading activity. Total number of frames in the replay and the frame number currently being displayed. Interactive controls to play and rewind trading activity in the ladder. State of the market at the indicated time. Total number of audit messages included in the replay timeframe and the number of messages currently displayed. 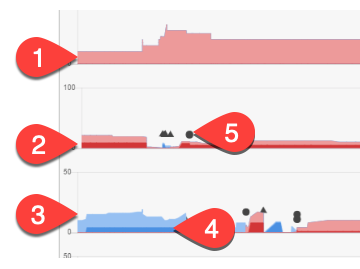 The Macro View is a visualization that displays a trader's order actions and executions in the context of market conditions at multiple price levels over time. This view is used to conduct a cluster review by allowing for a rapid assessment of the trader’s pattern of activity and any corresponding market reaction. 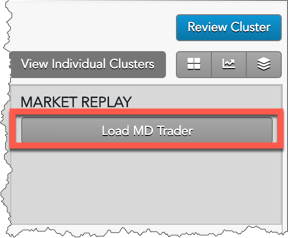 Note: You must load the market data in the MARKET REPLAY section before you can display the Macro View tab. Executed orders are represented as circles for sells and triangles for buys. The Macro View also contains a legend that describes the color scheme. You can click the colors to hide or show the corresponding data in the Macro View. By hovering the mouse on a specific data point, you can see the exact value at that time. 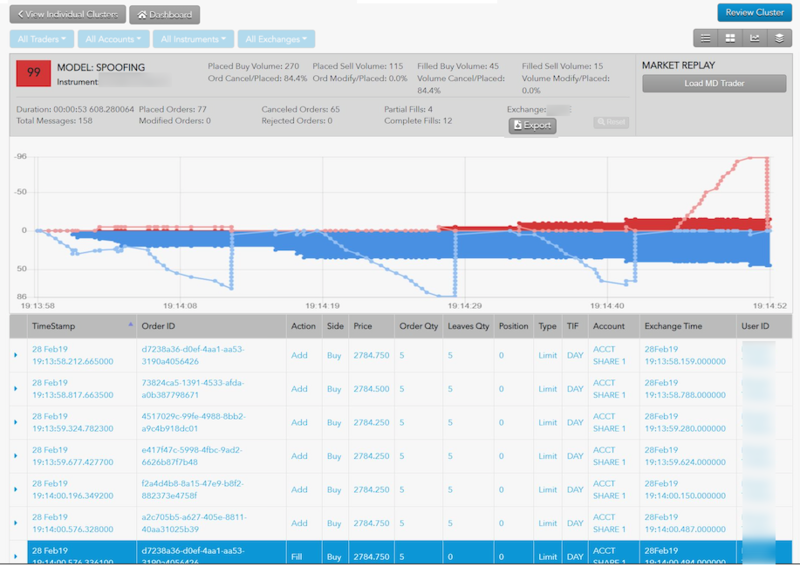 For example, by hovering over a light blue area, you can see the exact bid liquidity in the market at that point in time. Review Cluster: Launches the Review Sidebar for recording dispositions, viewing disposition history and investigations. Enter a disposition for this cluster group. Add this cluster to an existing investigation or create a new investigation to which to add this cluster.